Cellist Marjorie Bowman gave up an opportunity to play with Europe’s finest orchestras to become a music teacher in the West Australian wheatbelt town of Tambellup. In this story from issue 18 of Inside History, former pupil Ted Witham recalls her legacy. Broomehill farmer, shire councillor and bush poet Kym Crosby is now 59. Kym remembers arriving at the nearby Tambellup Shire Hall, 300km southeast of Perth, as a child for his weekly music lesson with Mrs Bowman. Kym’s lesson was near lunchtime, and he would come upon Mrs Bowman eating delicate sandwiches out of a little plastic box. Her demure appearance, however, was deceptive. Marj Bowman (née Pether) loved her fast cars, for example, and students remember 110km per hour dashes in her sporty MG Magnette to Wagin for the annual eisteddfod. Children remember details, but for adults looking back, what is more important is the world-class musical education Tambellup students received from the 1940s to the 1970s. Hundreds of kids ran, or trudged, or dilly-dallied, according to mood and weather, from the school down the dusty, or muddy, gravel path by Taylor Street to the Shire Hall for their lessons from Mrs Bowman, almost until her death in 1979. 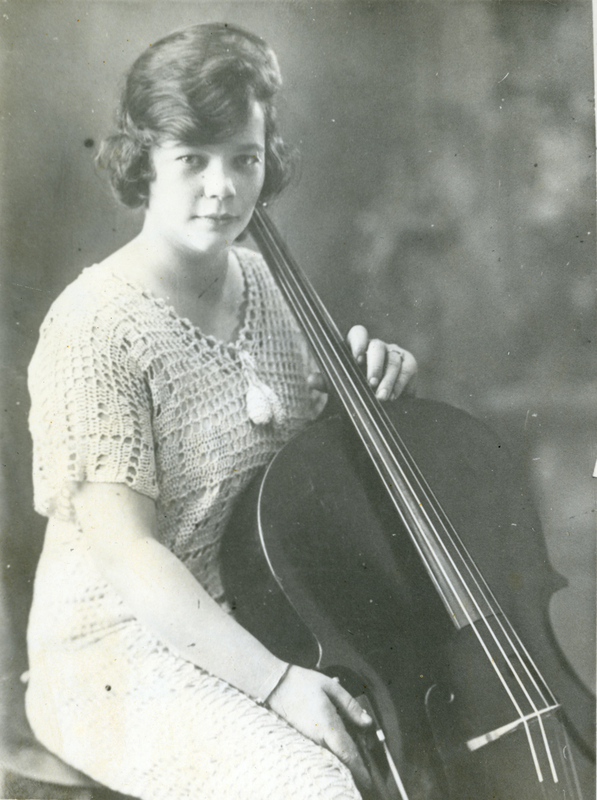 Marjorie Bowman as a young cellist in 1915. Courtesy Ted Witham. She taught mainly piano and cello, but also an astonishingly wide range of instruments including banjo, guitar, violin, sax and flute. “I remember the scales and chords,” says Eileen O’Neill, as she learned to play joyfully and competently and to appreciate the exotic world of classical music. Archdeacon Brian Newing remembers his lessons on descant and tenor recorders. “She was a perfectionist,” Brian says now. “When we did theory, everything was fastidious, every detail was corrected.” The musical disciplines Brian learned from Mrs Bowman have been a foundation for many facets of his long career as a country priest. Music ran in Marjorie Pether’s veins. She was born in Perth in 1897. Her father played violin, her mother piano. Like Marj, her sister played cello, while her second sister was an accomplished flautist. The family’s house looked over the Swan River to the growing capital city. The Pether household was known for its Saturday afternoon tea parties, and Marj and her sisters enjoyed dancing at the newly opened Pagoda Ballroom along the river in Como. From 1916, then 19 years old, Marjorie Pether was in demand across Australia as a soloist and a teacher of cello and piano. In Melbourne, she was called the “clever cellist”. The West Australian described her in 1918 as “Perth’s premier celloist [sic]”. In 1925, she was advertised in Hobart as a “charming cellist”. So it is unsurprising that she was invited to play her beloved cello as a soloist with the great orchestras of Europe. This exciting invitation arrived just after her engagement to a man she called “my Bert”. Marj thought she could defer her wedding until after her overseas trip. Bert Bowman had a different idea. “Either marry me or go to Europe,” he said. It turned out to be an easy choice — she wanted to be with Bert. This is how, in 1925, the rising cellist came to leave behind the comfortable life of a city celebrity for a pioneer farm 25kms from the small wheatbelt town of Tambellup. There she dealt with woodstoves and coppers for washing clothes, butchering farm meat and chasing dugite snakes out of the backyard. In between all this, she raised a family. Marj and her husband Bert at a wedding in 1959. Courtesy Ted Witham. the PSO, probably rising to the first cellist’s chair in the 1940s before turning to teaching in Tambellup. Her legacy is now spread around rural Western Australia. Former students still play piano or violin, others enjoy listening to orchestral music. Former students Jennifer Taylor-Miller, Marion Witham and Helen O’Neill have earned a living from teaching music. Marion recalls singing in pubs to make money when she was a student. “What Mrs Bowman taught me allowed me to play and sing a really wide variety of music,” says Marion. Kym Crosby recalls the moment he, and hundreds like him, stood on the big stage in the Tambellup Hall, bowed, and announced, “I am going to play Minuet by Beethoven”, before taking his seat at the piano and playing for parents and friends. He’d been taught how important the bow and little speech were — these rituals framed the music and gave it importance. At the end of the concert, Mrs Bowman bowed, and announced, “I am going to play Romanze by Hummel.” She then settled herself on her cushioned stool and positioned her cello spike in a hole she had herself drilled into the stage of the hall. She then drew her bow across her cello. For five minutes a rapt bush audience knew what music could be. This story originally appeared in issue 18 of Inside History.